I made the Bisquick Chicken Fingers recipe this week. Everyone liked it well enough, but it wasn’t a rave. Not something I will make again. There are just too many other chicken recipes we like better. And new ones to try. But the Oven Fried Potato Wedges…those will remain on the list of menu options. 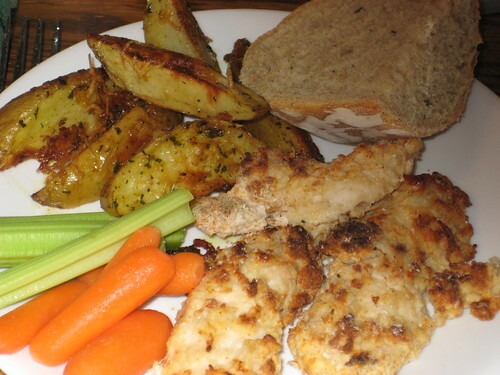 Supper consisted of the chicken fingers, potato wedges, rosemary bread, and carrots and celery. Here is the recipe as given, with the changes I made in bold. Wash the potatoes, cut them into wedges and put them in a mixing bowl. Pour the olive oil over them and mix to coat completely. 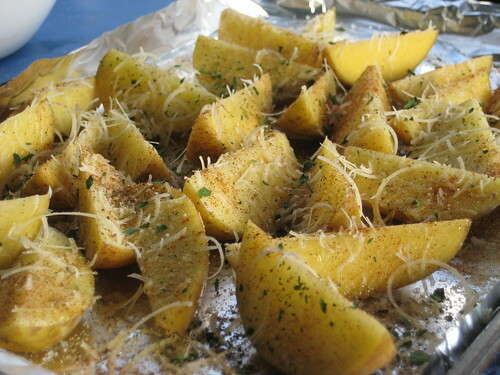 Lay the potato wedges on a foil-lined cookie sheet. If it’s regular foil, spray it with veggie spray. I like to use no-stick foil or parchment paper, if I have it on hand. I turned all the potatoes so they were skin-side down. That way, the white sides were able to brown and crisp. Pour any remaining oil over the wedges. Sprinkle with cheese and spices. The measurement of ingredients doesn’t have to be exact. I just sprinkled them on without measuring. 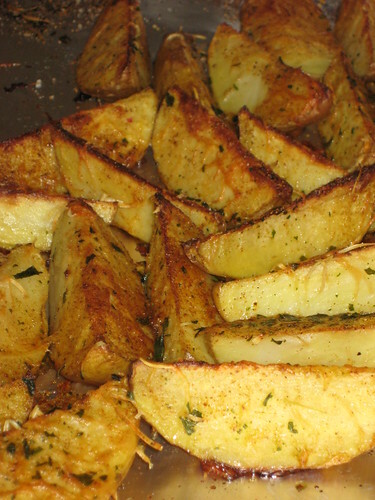 The potatoes could be seasoned with rosemary and parsley, if you prefer. They were delicious. Crispy and yummy. DD even thought they were good cold the next day when she ate some of the leftovers for a snack. This entry was written by ~~Rhonda, posted on February 28, 2009 at 2:41 pm, filed under cooking, Recipes and tagged bisquick chicken fingers, cooking, recipe. Bookmark the permalink. Follow any comments here with the RSS feed for this post. Post a comment or leave a trackback: Trackback URL.